It’s been a turbulent few years in the world and while movies can be a great escape from the chaos, they can also provide a revealing window into the past. Enter The Bad Sixties: Hollywood Memories of the Counterculture, Antiwar, and Black Power Movements, a new book by Kristen Hoerl that examines the ways film and TV have presented the protest movements of the 1960s versus the way they actually played out. It’s an academic, but accessible exploration which includes the distortion and exclusion which has colored audience view of the past. Hoerl focuses much of her attention on the way television shows of the 1980s like The Wonder Years, Family Ties, and thirtysomething portray the aftermath of the 1960s, but she does dip into movies both of the time and after the fact. She assesses an array of viewpoints, from the of-the-moment Easy Rider (1969) to later popular hits Dirty Harry (1971) and Forrest Gump (1994), which vary widely in their approach to what the decade had to offer. In a satisfyingly diligent way, Hoerl works consistently to set the record straight, validating the decisions and place of women and people of color in the movement, recognizing those that diverge from the heteronormative, and acknowledging groups that never or rarely get the cinematic treatment. She explores the way the Black Panthers have been misrepresented in popular culture, while also noting the exclusion of the Puerto Rican Young Lords, the Young Patriots, and the Brown Berets from screen narratives. Whether ignored, overly sensationalized, or distorted, these groups are often underserved in favor of promoting a point of view that validates the status quo. Her term for this collective erasure: selective amnesia. 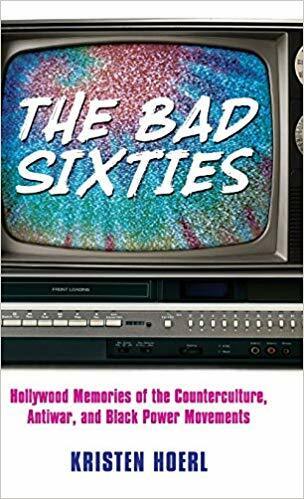 As it critiques the way protest movements have been portrayed in film and television, Bad Sixties serves as a reminder to view media with a critical eye and an awareness of the different perspectives and goals of those who create it. It also reveals a past with many characteristics in common with the present, from the drive to change societal structure to the establishment that scorns dissent.